Robotics and Artificial intelligence showcase was held in Manchester, 12th of March 2019. The Oil & gas technology centre had a really nice point cloud of oil rig, down to the minute detail (video below). The centre provides an umbrella for a number of smaller companies, one of which is the drone operator Air control entech. Air control entech operates large drones,, having operations and drone pilots. Clogworks manufactures drones (with distinct aesthetics), and CEO provided very interesting insight in radio link dependency. In particular, the main competition is from DJI with Lightbridge 2 radio link (5km range). Clogworks is happy with their new radio link 20km, 25Mbps (in co-operation with Sky-drone). The next step for Clogworks is further increasing the range and size of their drones (100kg payloads, e.g.). SMC corporation from Tokyo has an industrially used radio link (one master, 6slaves, 250kbps, frequency hopping – for security reasons, 5ms delay) EX600-W. The links is used for robotic arms where due to the movement the data link cable gets broken often, or where the robotic arm needs a full 360degrees movement at the pedestal. SMC is the only vendor of wireless solutions for robotics in the UK. University of Liverpool has active co-operation with Kuka robots, and has won some awards from Kuka challenges. ABB has reserves with wireless communication from the safety – risk point of view. ABB does not, as of 2019., manufacture moving robotic platforms. Automata exhibited their Eva robotic arm for less than £5,000. Manufacturer of European Mars rover, SCISYS are moving away from nVidia (clearly for radiation hardening reasons). London based, Sensing feeling has a low power solution (Jetson TX2 –> Xavier, and Intel Atom + Movidius VPU platform – I assume Myriad X) for face and feelings recognition. Mobile world congress in 2019. was just a slight improvement against the last year MWC. The main theme changed from selfdriving onto robotics and computer vision. Both selfdriving and robotics are powered by AI (Artificial intelligence). And 5G was everywhere (and real 5G modems, not power point modems, as per Huawei). 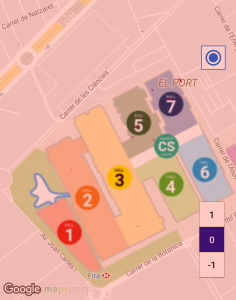 Less cars in MWC 2019. than in MWC 2018. BMW concept car. FaceBook, together with many operators is trying to support open source community to develop ecosystem that could compete against Huawei, named Telecom infrastructure project (TIP). One part of the TIP is CrowdCell which was presented in FaceBook’s booth, and for the purpose of demo, integrated with Athonet nVidia GPUs server. A mobile phone connected to CrowdCell running an application Pose DNN on nVidia GPUs. The table below contains some comparison between Huawei AI and the rest. Xilinx Zync (RFSoC) ? ? Google TPU (?) 45TOPS Int8 ? Xilinx has on its stand an impressive Zynq RFSoC solution (8×8 MIMO) and Virtex xDNN FPGA card. Main job for FPGA card is image recognition, and to lesser extent speech processing. There’s a new versal architecture on 7nm coming end of the year. Orbl.io is a small Estonian company providing 5x DNNs to determine face, age, gender, emotions and liveliness of a person. Orbl sales are in Bay area. Israeli stand is again bigger this year. It always seems to be the most innovative and commercially ready stand. Elsight had a highly networked solution. E.g. 4x radio links of 4x different operators from a single base station. This DRAM contract price not going down is interesting. Definitely, the reduction in price is what would be expected based on DRAM price cycles. One of Small cell forum vice-chairs is now with BEC technologies. In the new technologies hall 8, an interesting information on a start-up doing quantum computing with entangled photons, based on silicon photonics. PsiQuantum (hiring) is led by ex Bristol University and Imperial college professors Jeremy O’Brien and Terry Rudolph (Erwin Schroedinger’s grandson). Denavit Hartenberg parameters for serial manipulators. Those thinking 2018. MWC lacked sparkles, obviously didn’t see dazzling 3D Hypervsn(TM). All mobile processor manufacturers have added, next to graphical processors, Artificial intelligence (Neural networks) engine to their ARM processors. There was no information on Huawei, and Apple AI processors – but they doubtlessly exist. Israeli syte.ai has a mobile app which can take camera photo to identify clothes (brand) on the person one envies and finds the price and where to buy it. Another company has a ‘self-driving’ system for the passenger – one gets all the information about shops, restaurants, hotels, etc… on the camera photo, while being a co-driver. Fraunhofer institute demonstrated shortened TTI implemented in USRP. SoftBank robotics brought childlike robots Nao and Pepper which were popular with women. Audi A8 has about 50x ARM processors. (Ridiculous) concept car on Mercedes stand. Braincom-project.eu has increased the number of brain implanted electrodes from few hundred, to, using graphene, few tens of thousands of electrodes. Discrete path planning and solving algorithms (A*). Sensor fusion used to predict other objects behaviour. 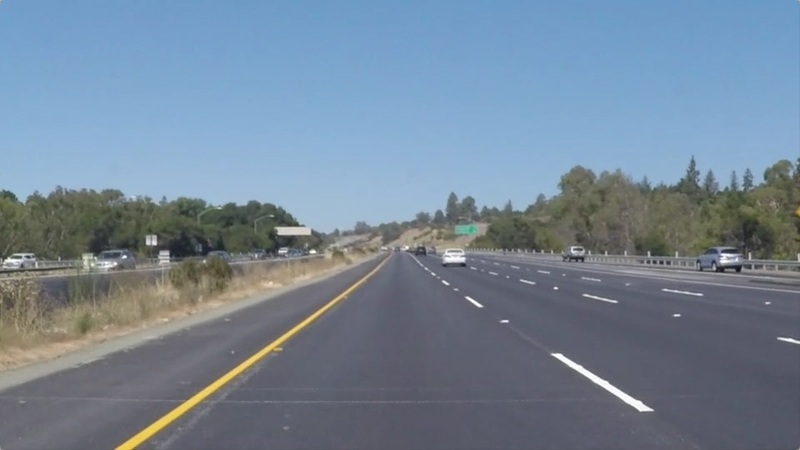 Drive a car down a highway with other cars using one’s own path planner. Architectural overview of ROS framework and setting up the environment. Running the code on Carla, Udacity’s autonomous vehicle. 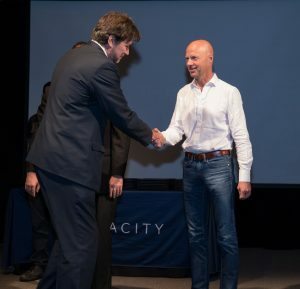 Inaugural class of Udacity Self-driving nanodegree graduation celebration with Sebastian Thrun. Technical support for the event was provided by SoftBank, ITRI and Magnum, a.i. Meeting with Small ePC vendors, possible participants of Small cell forum Private ePC plugfest (in the role of Small cell forum Interoperability chair). 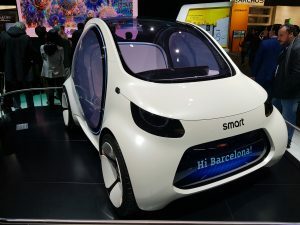 Vodafone had Huawei‘s demonstrator for 5G (and possibly autonomous driving) running car simulation in PlayStation 4 (it seems Huawei doesn’t like x86 technology – I wouldn’t be surprised if Huawei and Sony announce partnership – for microprocessor/GPU/sensors, as Huawei is cut-off from top US tech.) Car simulation was not good/ convincing – if autonomous driving algorithms were used (and simulation had road-works/ cyclists/ pedestrians…). I observed a simulation similar to Huawei’s on Orange stand. Qualcomm had on their stand SnapDragon with DNN support through Adreno (GPU that Qcomm bought from AMD some time ago) manned by a Chinese person. A lonely stand, except for one more Chinese visitor – so the conversation was in Chinese. Ni hao. Not impressive (particularly in the light what other companies think about DNN on SnapDragon). From Israeli stand, I got some indications how quick DNNs in mobile deployment, generally are. NI (National instruments) had a very nice 5G setup. To predict when NN can fail (not clear if this is a computable problem) – Anyone who trained NN knows it can fail unpredictably – solution to this problem will help DNN deployments tremendously. To prove professor Penrose’s objective reality of quantum physics, by gravity induced collapse of quantum wave functions through an experiment. I spoke with Spanish satellite defence contractor, on the combination of Phased array antennae with Luneburg sphere. ( Hall 1: people who bought their way in. Some media on this site is the work done for Udacity Driverless car nano degree.